New Member applications are available at Lindner's Golf Shop on Sheridan Drive across from the Sheridan Park Golf Course course or click here. USGA's 2019 Rule Changes - as you've likely heard, there's many changes to the official USGA rules - most of which are designed to speed play and make the rules simpler. To view a good video summary of the new rules on the USGA's website click here and if you have a smartphone there's an awesome USGA Rules app available in the iOS and Android app stores. 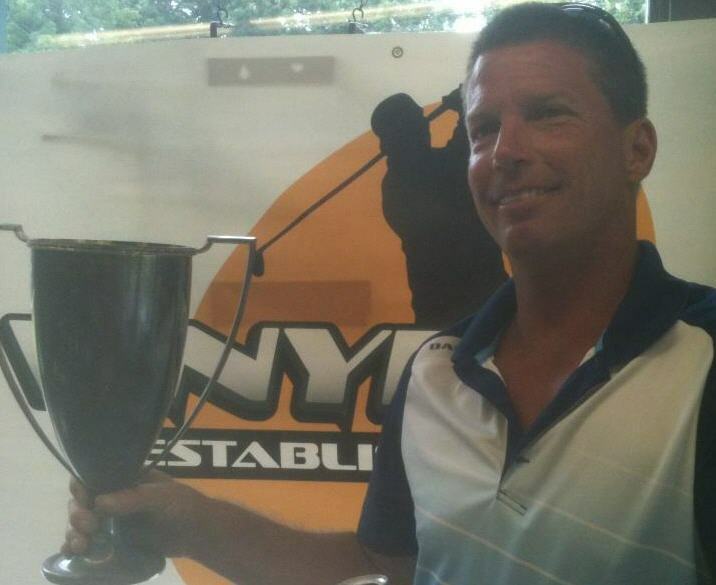 Sheridan Members Win Publinks Tournaments - Congratulations to Dana Harrington on winning the Publinks Class B Individual Championship on July 13th and 14th at Sheridan and Bob Buscaglia on winning the Publinks Class C Individual Championship on July 15th at Grover. Club vs Club Tournaments - Sheridan defeated Brighton in the 2017 Town of Tonawanda Director's Cup played at Sheridan but lost to Deerwood in the Annual Sheridan-Deerwood Challenge at Deerwood. Memorial 4-Man Scramble - congratulations to the team of Dana Harrington, Joe Abbarno, Kevin Mulvey, and Bob Trimper Sr on winning the Scramble with a team score of 59. Course is Open and Handicap Posting has Begun! Individual - congratulations to Brian Engl (Class AA), Dana Harrington (Class A), Ryan Reed (Class B) and Tom Candino (Class C) on winning their flights and to Ryan Reed for winning the playoff of flight winners to win the overall Tournament. 2-Man - congratulations to the team of Joe "Ballz" Abbarno and Dana Harrington on winning the 2-man tournament. Fall Scramble - Congratulations to the team of Bruce McDonald, Bill Samson, Norv Souter and Ray Souter on winning the Memorial Scramble with a score of 60. This year's event was in memory of Jim Lipps and Charlie Card. Sheridan-Deerwood Challenge - Congratulations to the Sheridan team of Glen Gast, Dan Misko, Jeff Frey, Brian Engl, Dave Morgante, Don Osborn, Joe Abbarno, Kevin Mulvey, David Byrwa, Jonathan Byrwa, Bill Samson, Bruce McDonald, Tim Dean, Jeff Spriegel, Ryan Reed, Jere Reed, Dana Harrington, Brian Spencer, Jim Lyons, Bob Trimper, Tom Osborn, Jim Ticco, Gerry Ricketts, Mark Dominguez, Norm Nieminen, Jim Mary, Doug Mack and Frank Sava on defeating the Deerwood team 30.5 to 25.5 at Deerwood. This marks the 3rd time Sheridan has won in the 4 years this annual event has been held and the first time either team has won on the other team's course. Director's Cup - congratulations to the Sheridan team of Scott Wilson, Dennis Buckley, Jerry Reo, Bob Lombard, Joe Roncone, Tim Dean, Sam Crisante, Dave Spindler, Tom Osborn, Chuck Partsch, Jonathan Byrwa, David Byrwa, Jon Benson, Brian Engl, Vince Puglia, and Mike Knott on defeating the Brighton team 17 to 15 at Brighton. For individual match results click here. Invitational/Member-Member results - Overall - Bill Lindner & Mark McIntosh; McIlroy Flight - Al Walker & Todd Beringer; Spieth Flight - Jeff Spriegel & Bob Trimper; Watson Flight - Buzz Buscaglia & Jim Inzinna; Johnson Flight - Bob Cieri & Ron Pelligrino. Congratulations to the winners and thanks to everyone who participated and volunteered to help out. Senior Club Championship results - Overall Gross - Steve Stone, Overall Net - Joe Roncone Jr, Super Senior - Jon Benson, Flight 1 - Steve Stone, Flight 2 - Joe Abbarno, Flight 3 - Joe Roncone Jr, Flight 4 - Jim Gramlich, Flight 5 - Frank Sava, Flight 6 - Ron Henri. Congratulations to all the winners. Spring Scramble - Congratulations to the team of Travis Hardman, Tony Sweeney, Glenn Eberhardt, and John Reynolds on winning Sunday's 4-man Scramble. Hole-in-1 -congratulations to Dave Frank on his Hole-in-1 on Sunday during the scramble and Mark Engl on his Hole-in-1 the day before. I'm told that neither had paid the $10 to get into the Club's Hole-in-1 Club. Correction - the Membership letter that was mailed out had an incorrect date for the Spring Scramble - the correct date is Sunday May 3rd. Director's Cup - Congratulations to the team from Sheridan in defeating the team from Brighton in the 2014 Town of Tonawanda Director's Cup match played Saturday Sept 20th at Sheridan. Fall "Memorial" Scramble (Remembering Neil Downey and Paul Carr) - Congratulations to the team of Don Osborn Jr, Tom Osborn, Jim Ticco, and Bill Hartnett on winning with a team score of 60. Invitational - Congratulation to the team of Tom Candino and Kevin Kopec on winning the Invitational with a score of 118. Other flight winners: Snead Flight - Dave Morgante & Mark Kantowski - 124; Woods Flight - Dave Rechin Jr & Rich Cech; Nicklaus Flight - Joe Gugino Sr & Joe Gugino Jr - 126; Hogan Flight - Frank Briandi & Mike Digati - 130 (MOC). Membership Incentive - club members who recruit new members will receive a $20 discount on their 2015 Membership dues. Download and print the New Member Application (click here) and make sure the new member puts your name on the form as their 'sponsor'. Sadly, we lost four members of our club over the last year - Neil Downey, Paul Carr, Dan Mergenhagen, and Ron Hodak. Our condolences to their families. Club Championship - Congratulations to Joe Gugino Sr, Chris Robey, Bob Trimper, and Jim Mary on winning their respective flights - for more information click here. May 5th Scramble - congratulations to the team of Joe Gugino, Frank Tedesco, Joe Jack, and Tom Mohan for winning with a score of 63. Have an iPhone or Blackberry? - download the USGA Rules of Golf app for your smartphone. Click here. Membership applications are available by clicking here. You can also pickup applications at Lindner's Golf across from the course on Sheridan Drive. Please read these Important Handicap Reminders. President's Cup - Congratulations to Vince Puglia Jr on winning the individual President's Cup tournament. Vince defeated Norm Nieminen in a close match to win this tournament for the second consecutive year. 1st Annual Sheridan-Deerwood Challenge – The Sheridan Park Golf Club narrowly defeated the Deerwood Golf Club 16½ to 15½ on Sunday October 7th at Sheridan. Vince Puglia Jr and Dan Misko swept the final four points to give Sheridan a stunning, come from behind victory. For more details click here. Memorial Scramble (this year in honor of Carl Lomanto Sr and Elmer Nobilo) - congratulations to the team of Dennis Buckley, Jeff Feather, Vince Puglia Jr, and Dave Spindler winning with a score of 58. Club Championship - Congratulations to Mike Knott, Joe Gugino Sr, Joe Venezia, and Jim Inzinna on winning their respective flights in the 79th Club Championship. Details and a photo - click here. WNYPLGA - Congratulations to Sheridan Club Member Jim Mohan on winning the WNYPLGA's Senior Championship at Glen Oak on July 31st with a 73. Also congratulations to Jay Robbins on winning his flight in the same event. For full final results, click here. WNYPLGA Senior Championship - Congratulations to Tim Reilly and Tom Wilson on winning the Publinks'Senior Better Ball Championship on June 8, 2012 at Dande Farms with a score of 70. Spring Mixer 4-Man Scramble - Congratulations to the team of Don Osborn Jr, Steven Cohan, and new members Matt Thomas and Jonathan Bellomo on winning with a score of 61 (two lower than last year’s winning score of 63). 4-Man 'Memorial' Scramble - Congratulations to the team of Hank Bogdan, Glen Gast, Jeff Frey and Steve Jensen on winning on a match of cards with a 62. 2-Man President's Cup - Congratulations to Mike Zimmer and Jim Schreckenberger on winning the 2-Man President's Cup tournament with an extremely close final match win over Tim Dean and Dana Harrington 1 Up on Sunday August 28th - for full results click here. May 22nd 4-Man Scramble Results - Congratulations to the team of John Scive, Joe Roncone Jr, Frank Tedesco, and Tom Mohan on winning the scramble with a score of 63 on a match of cards.